Did you have any trepidation being an American author taking on such a British institution? Whenever I approach a book, I have a great deal of concern that my readers will get the best possible experience I can give them. Part of that is making sure that the characters are real and they resonate, the story is credible and that the book moves seamlessly. Now, when I looked at the prospect of writing the book that became “Carte Blanche”, I approached it as I really did any other, and that meant that I had to step into the shoes of the character in the book, most notably of course James Bond, and that is something that added layers of responsibility. Because my fans have to be happy but the many fans of Ian Fleming and the people like yourself have so respected and honoured him and the character he created had to be content as well. I have to say I felt a bit easier to become Bond than to than certain other characters I have created. For instance, in my book “The Twelfth Card”, one of my characters was a 12-year-old African American girl. Well, I had to step into her mindset. That was particularly difficult. Bond, roughly thirty year old professional agent, that is a bit closer to some of the other characters I’ve created. But I will tell you, on every page, I kept asking myself, “is this what the devotees of James Bond will want?” I want to make sure I give them an enjoyable experience. If you were to imagine Ian Fleming creating this character today, do you think there would have any differences in how you approached updating Bond for today's world? That’s a very good question. I think I can honestly say, were Ian Fleming still around, he would look at “Carte Blanche” and the Bond I’ve created and recognise him and would feel that this was a character he would feel right at home with. There are a few distinctions and I have a wonderful publicist here and I am going to give her a heart attack right now, and I am going to tell you one thing that Ian Fleming might say, “well that’s a little curious,” my James Bond is a former smoker. He no longer smokes. If someone unfamiliar with your work or the Fleming legacy read 'Carte Blanche', do you feel that there any clues to the fact that it is part of a greater world of Bond and also not written by Fleming? The story, the plotting, of “Carte Blanche” is pure Deaver. There’s no question about that. I have multiple sub-plots going on that continue throughout the book up until the very, very end. I have a lot of esoteric information. Click here for Carte Blanche release data. You can see we have the character Don who is clearly nasty but there is something else going on behind Don. As we expand into future chapters we learn some very interesting esoteric information about the over all shenanigans involved in Incident 20 (that is what Bond is trying to stop) and toward the end of the book there are many surprises set up. The Bond character who you have a little snippet of in Chapter 2, you’ll see he is, to a large extent, the same single minded hard-boiled professional that I think Fleming would recognise and that fan will recognise as well. As the story moves along there are other elements of the Bond that echo to the character that Fleming created, which will be instantly recognisable. If you could summarise what fans could expect in a single sentence, how would you do it? 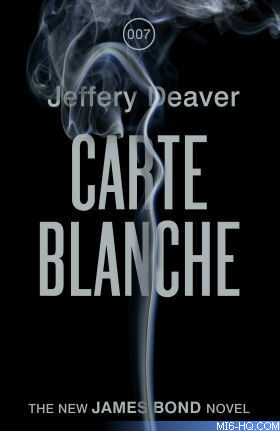 In reading “Carte Blanche” fans will be treated to a typical, relentless, fast paced, rollercoaster of a Jeffery Deaver novel centred around everyone’s favourite spy, James Bond 007, who, the poor fellow, never gets a moment’s rest throughout the entire book. 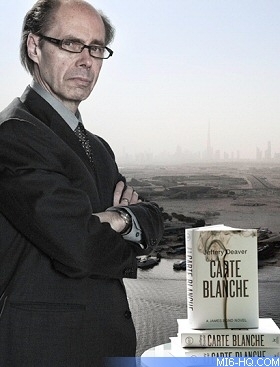 Stay tuned to MI6 for more from Jeffery Deaver and complete coverage of Carte Blanche events this week.